Square foot gardening allows you to plant many different types of vegetables in a minimum amount of space. This will help you get started! Square Foot Gardening was started by Mel Bartholomew and he was experimenting on how to grow the most amount of vegetables in the smallest space available. He found out through his research that the key was in the soil. If the soil was enriched with tons of organic matter than the plants thrived and grew faster, stronger, and produced fruit quicker. He also noticed that there was a lot of wasted space in backyard gardens that created row gardens similar to what farmers do. Farmers have row fields so that heavy machinery can go down them easier. You don’t really need to do that in your own backyard vegetable garden. Plus, in most cases he found out that you could do successive plantings in one growing season as the plants tend to mature faster and set fruit earlier than in regular gardening settings. The most popular square foot garden size is 4′ x 4′ as it is easier to reach into the center from all sides and you don’t have to step inside the square and trample plants or soil to tend to the garden. Use six-inch wide untreated lumber to build the outer square, but it can also be built with cinder blocks, bricks, and other materials. It is important to place a weed barrier down to prevent weeds and grass from growing up into the plants. If you are growing this on a patio or balcony, make sure to attach a bottom to the outer 4×4 square and you can make it 12-16” high. This height can grow many different types of fruits and vegetables! The most important feature of square foot gardening is using this specific enriched potting soil mixture: blend different organic materials by using equal parts of bagged organic potting soil or compost, vermiculite, and peat moss. If using organic potting soil instead of compost, mix a few different brands together to give a good variety of nutrients to the mix. Every different brand of potting soil on the market has a unique blend and you want to capture those differences for square foot gardening. Add in organic fertilizers to this initial mix with a cup of blood and bone meal plus 2-3 cups of earthworm castings depending on the depth you have chosen. Once you have filled in your square, water it down until you can squeeze a handful of the soil and no water drips out – that’s how you can gauge when all the water has been completely absorbed. Keep the soil evenly moist and don’t let it dry out. 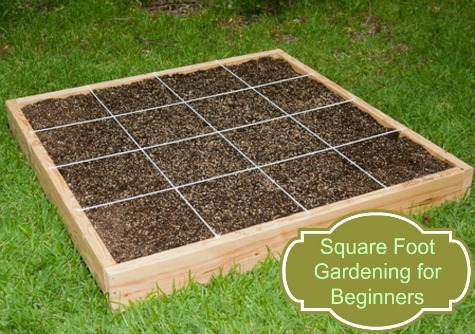 Have you done any square foot gardening? What are some of your best tips for beginners? « Easy Chili Recipe | Just 30 Minutes To The Table!